After a few days of sunny beach afternoons, fantastic local attractions, and all the amenities that attract people to the Outer Banks, many visitors find themselves daydreaming about a more permanent vacation. Whether your ultimate goal is to own an investment property, a retirement or vacation home, or simply a year-round home on the beach, the Outer Banks is filled with incredible opportunities and a variety of properties for sale. Many frequent vacationers eventually turn into investors or year-round residents, and as a result, there are countless resources available for newcomers to the Outer Banks real estate market. With so many options, and so many varying factors when it comes to purchasing beach property - from flood insurance to rental income - the local market might be a little tricky to navigate at first glance. Thankfully there are plenty of experienced local REALTORs who have been in the 'Banks business for decades, and are experts at helping newcomers or first time buyers get their feet wet in the local market. Your best bet before embarking on a new home or property purchase is to contact a local REALTOR in your area of interest, whether it's the northern Outer Banks communities, the central towns of Nags Head, Kill Devil Hills and Kitty Hawk, the picturesque soundside towns of Manteo and Wanchese, or the southern regions of Hatteras and Ocracoke Islands. Every area of the Outer Banks has real estate companies and experienced agents on hand to assist new buyers and answer questions. That said, many folks who are new to the Outer Banks real estate market generally have a few standard questions in mind as they begin their search for their permanent dream home. With this in mind, feel free to review the list of frequently asked questions about the local Outer Banks real estate market, and remember that the majority of the year-round population and second homeowners on the OBX are folks who always loved the area, and decided to take a chance and pursue their dream of a long-term, forever home. An online search, (like the one below), is the best starting point for embarking on a property purchase on the Outer Banks. The local MLS (Multiple Listing Service) allows REALTORS to enter extensive property details, multiple photos, and even virtual tours, allowing prospective buyers a wealth of information about specific properties in their OBX area of choice, without making a special trip to the islands. Once you're narrowed down your search, it's time to contact a local REALTOR. A local real estate agent can help you obtain more details about your favorite properties, such as tax information or surveys, and can even help you find additional properties that meet your requirements. In fact, some local agents even offer automated emails that notify you the second a new listing hits the market that matches your criteria. For in-person visits, a REALTOR can also take you on guided tours to your favorite properties, while providing you with plenty of area information. Schedule an appointment with a real estate agent on your next vacation, or get started now with an easy and thorough online search. In a word, Everything. The beautiful thing about the Outer Banks real estate market as opposed to other beach resort destinations is that buyers have a wide selection of properties to choose from, from single bedroom soundside condos to 20 bedroom oceanfront castles. There are literally thousands of real estate listings for sale on the Outer Banks, ranging from the Inner Banks towns and the Dare County mainland to the desolate beaches of Carova and Ocracoke. When you're first starting to look at properties for sale, it's imperative to narrow your search so you don't have to root through hundreds if not thousands of properties for sale. Factors to keep in mind include property types (condos, single family homes, mobile homes, or timeshares), location (both town or area and proximity to a local sound or the ocean), and size. You'll also want a mental list of other amenities you'd love to have in your dream property, such as private pools, community facilities, game rooms, views, or any other special feature that's specific to your criteria. Varying budgets and price ranges will also find plenty of options, with home prices starting at around $100,000 and escalating to $1 million or more, depending on the property. Having trouble narrowing it down? A local real estate agent can help you take those broad strokes and turn it into a more manageable list of properties that fit your specific requirements. Don't be afraid to contact a local agent and ask for help - most all REALTORS on the Outer Banks are happy to provide free consultations. The majority of properties on the Outer Banks, particularly along the oceanfront and in tourism-oriented communities, are second homes or "investment properties" owned by individual owners, families, or groups of investors designated as LLCs. Some owners who live in the area may choose to rent out their home themselves, but basically, an owner that wishes to rent their home or condo on a weekly basis will list their property with a local property management company in annual or two-year increments. The property management company takes care of all the routine work that comes with renting a vacation home, including advertising, guest check-in and check-out procedures, routine and on call maintenance, weekly housekeeping, and much more. This allows the owner to rent their home to weekly tenants, but enjoy stress-free management and maintenance. In return, the vacation rental company typically receives a minor percentage of the home's annual income. North Carolina Real Estate Law does not allow all property management companies to set a standard commission, and instead, the percentage must be decided upon in a contract between the company and the owner. In addition, the owner covers the cost of basic utilities or community / subdivision fees, although some costs, such as pool heat or cleaning fees for a pet friendly home, can be passed to the vacation rental guest. Many owners find that listing their property with a local management company is well worth the commission, as the company can advertise, monitor, and easily care for the home in the owner's absence, ensuring that all an owner has to do is make sure they reserve their own "vacation weeks" well in advance. Every community on the Outer and Inner Banks has the potential to be a phenomenal locale for a vacation rental home, however, the majority of rental homes are located directly on the barrier islands. Look for popular communities or subdivisions within the northern, central, or southern Outer Banks regions, or simply head towards the water. The oceanfront and soundfront vacation rentals are among the most popular on the Outer Banks, simply for their incredible views and access. Properties that are one or two lots away from the water, and feature easy public access or gorgeous views, are also popular locales for vacationers, and even small hidden homes in the local maritime forests can attract nature lovers and tourists who love a little privacy. You'll also want to keep an eye out for guest-friendly amenities, including a private pool, hot tub, game room, or even a theater room. Special amenities and perks go a long way with guests, and an investor looking to maximize their income should bear this fact in mind. In a pinch, it's smart to start looking at the areas of the Outer Banks you love the best. After all, once you purchase a vacation rental property, it will be your lifetime vacation rental home as well. There are many great reasons to purchase an Outer Banks vacation rental home, and the longstanding popularity of our resort community makes property purchases a solid investment. Each year the Outer Banks is noted as a top family friendly vacation destination with an emphasis on our award winning beaches and unique seasonal activities and festivals. When considering an investment purchase, it's important to work with a local real estate broker who is familiar with the Outer Banks vacation rental industry. A seasoned agent can provide you with the information you need to determine if purchasing on the Outer Banks is a good addition to your investment portfolio. "Actual" Rental Income - In most ca you can review current and historic data on the actual rental income produced by the home you intend to purchase. "Projected" Rental Income - For new construction houses or properties not previously rented, a property management company can provide a projection by analyzing income from similar homes in comparable areas. Property Management Fee - Request the annual management fee that a property management company will charge to oversee the rental of this home. Utility Expenses - This information is not always readily available, but some owners are able to share this data with prospective buyers. Home Maintenance - An experienced broker can provide you information to budget for annual home maintenance costs. Pool and Spa Maintenance - When applicable, you can readily obtain annual expenses for maintaining pools and spas. Taxes - Annual tax rates are available for each property listed for sale. Insurance Costs - Local insurance companies can provide the amount buyers will need to budget for annual insurance expenditures. Gathering this valuable information up front allows buyers to develop a much clearer picture of the costs to own on the Outer Banks and to determine the Return on Investment (ROI) percentage. In some cases, buyers will be pleasantly surprised to discover healthy 10-12% ROI and a few opportunities that exceed these amounts. Beyond the investment aspect, purchasing an Outer Banks vacation rental home allows you to spend valuable time with your family at the beach! ; With advance notice, owners can block weeks for family use, gift the use of the home to friends and extended family or donate a week for charitable functions. Prospective residents will find plenty of properties for sale designed with year-round residents in mind. These properties many not feature the extensive game rooms, theater rooms or multiple bedrooms that a vacation rental home can have, but they do have lovely lawns and gardens, comfortable living spaces, and plenty of friendly neighbors. Potential full-time residents have their pick of condos, single family homes, or even mobile homes which can be found from Ocracoke to the Inner Banks communities on the mainland. Local lenders are just as adept at assisting first-time homebuyers as they are investors, and can offer competitive interest rates for potential residents. In addition, depending on the area, virtually every budget can be accommodated, and folks will find the selection of year-round homes competitively priced, especially in relation to other vacation destination and resort markets. In other words, future residents will find plenty of opportunities available in their favorite areas, making the daydream of Outer Banks relocation well within reach. Like vacation rental or investment properties, year-round homes can be found in virtually every area and town of the Outer Banks, although there are some communities that are more residential in nature than others. The Inner Banks areas of the Currituck mainland, Elizabeth City, and the Dare County mainland are an attractive possibility for year-round prospective buyers. For one thing, these areas are relatively quiet and free of tourism throughout the year, but still offer exceptional sound or canalfront access for water lovers. Also, with a location of 45 minutes or much less from the Outer Banks' barrier islands, all of these areas present new residents with an easy commute to an on-island job, or just a day at the beach. For another, the prices in these regions are generally cheaper than the busier tourist hot spots, allowing first time home buyers or relocating families more options at a competitive price. On the soundside of Kill Devil Hills lies Colington Harbor, a collection of namely residential homes and year-round neighborhoods with exceptional sound and saltwater canal access. This area of the Outer Banks is close to the action, but also offers proximity to the central Outer Banks' schools, community golf and recreational clubs, and public boat ramps and sound access points. Manteo and Wanchese are also incredibly attractive locales for full-time residents, as they have a world of attractions and amenities, including the NC Aquarium, the Elizabethan Gardens, the Wanchese waterfront fishing docks, and the historic Downtown Manteo, but still maintain a small-town feel. In these areas, prospective residents will find a wide selection of year-round homes with gorgeous gardens, friendly neighbors, and easy access to essential services, like the DMV, government facilities, and local grocery stores and shops. Hatteras Island is also home to a number of small and almost hidden primarily residential communities, specifically in Avon, Buxton and Frisco. Avon Village is a quiet "small town" within a small town, and is the perfect neighborhood for families with uncrowded streets, generations of neighbors, and lovely small homes with a few vacation rentals sprinkled in. In Buxton and Frisco, year-round residents flock to the woods, where a number of residences are perched high up at some of the highest altitudes on the Outer Banks, safe from potential flooding, hidden from the main roads, and close to Hatteras Island's exceptional elementary and secondary schools. While certain areas of the Outer Banks may seem designated for year-round residents, virtually any stretch of beach can serve as a fantastic year-round home. Keep your options open and don't be afraid to explore, and as a result, you're sure to find a wonderful property for sale that your family can truly call home. Because the year-round population of the Outer Banks is comprised primarily of "newcomers" who fell in love the area and eventually moved to the beach, folks interested in a beach relocation will find plenty of options and information available. Your first stop for relocation information should naturally be your buyer's agent. Your REALTOR can provide you with a wealth of information, from local plumbers or electricians to hair salon recommendations. Don't be afraid to ask questions - your agent will be happy to assist you in getting a head start in fitting into the beach life. Another great source of information is the Outer Banks Chamber of Commerce. As a representative collection of local businesses, vendors, and services available on the Outer Banks, the Outer Banks Chamber of Commerce can provide lots of helpful relocation information, from local voting centers to employment opportunities. A visit to their website, will certainly prove to be a fantastic introduction to the Outer Banks for new residents. New residents can also check in with the county of Dare or Currituck, depending on where their new home lies, for essential relocation information. Both counties have extensive websites that list important department contact info, (like water department of sanitation department), available local government jobs, and local ordinances and regulations. Both counties also have personnel on hand that can help answer department specific questions. Finally, once on the Outer Banks, new residents who want to be in the know about local events, community groups, or local happenings, are encouraged to check out their local papers. The Island Free Press and Outer Banks Voice both have online "newspapers" that can be accessed with just a couple clicks of the mouse, and the Outer Banks Sentinel and the Coastland Times are standard newspapers that cater and cover the OBX region. For upcoming events, community gatherings, and an outlet to what's happening on the beaches, the local papers are an essential tool for Outer Banks residents. One additional cost on the Outer Banks that many mortgage companies require, especially in areas that are close to the ocean or sound, is flood insurance. Many homes on the Outer Banks, with the exception of properties that are located well above sea level, are located in a flood zone, which means that in addition to the standard homeowner's insurance, prospective buyers will be required to purchase a flood insurance policy as well. The good news is that flood insurance is relatively inexpensive. For example, flood insurance for a $200,000 loan typically runs around $500 a year, and that amount is factored into your monthly mortgage payments. Some subdivisions or communities may also have additional costs, such as community grounds maintenance fees, or pool or club memberships. Condo complexes on the Outer Banks generally have an extra community cost for maintenance, trash service, or water service, although prospective buyers will generally find this information stated clearly on the real estate MLS listing. Other than community specific costs and flood insurance, many new owners find those extra expenses associated with being a homeowner incredibly competitive with other areas. Tax rates are quite low on the Outer Banks, and in Dare County, extras like sanitation service or community dumps are free to all residents and owners. Basically, prospective buyers who are concerned about the additional cost of owning an Outer Banks property have little to worry about. An experienced lender or real estate agent will also notify you well in advance of going under contract of any additional expenses you can or should expect. Granted, mortgage companies on the whole are more cautious about distributing home loans, however lenders on the Outer Banks are specialists at second or investment home purchases, and can generally make the home buying process a lot simpler for new OBX buyers. In the mid-2000s, obtaining a mortgage was a simple affair, with plenty of fixed rate, adjustable rate, and balloon payment options available. Today, those same rates and plans are available, however new buyers should expect a little bit more paperwork and time to complete the process. Expect to have two years of tax returns available, a year of income statements, and detailed bank statements showing your earnings and savings. Lenders may be more detail oriented these days, however, buyers will find that once qualified, the options are endless. Adjustable rate mortgages (ARMs) are still a relatively popular option for buyers who expect to own the home for only a few years, however with the incredibly low interest rates, fixed rates at 10, 15, 20 or 30 year increments have more or less become the standard for Outer Banks buyers. Ready to make an offer? Many lenders are happy to review your financial background ahead of time, and give you a pre-approval letter to submit along with your offer to purchase. This lets the sellers know you're a serious and qualified buyer, and can also give you the peace of mind of knowing once the contract is signed, there won't be any financial headaches along the way. A local real estate agent can give your local lender recommendations, or you can check with the Outer Banks Chamber of Commerce for local mortgage companies, lenders, and banks that specialize in second homes, investment properties, and the local Outer Banks real estate market. Visitors are delighted to find that only certain areas of the Outer Banks can be developed. For example, on Hatteras or Ocracoke Islands, it's not unusual to find 4-6 miles of developed areas surrounded by a dozen miles of undeveloped seashore, managed and maintained by the National Park Service. However, prospective buyers will still find plenty of undeveloped lots and tracts of land available for sale in virtually every community of the Outer Banks. And prices are incredibly attractive to developers or builders, ranging from the $20,000s to the $200,000s or more for prime oceanfront or soundfront locations. For prospective Outer Banks home owners who have a clear vision in mind of their dream house, it is most definitely worth the extra leg work to purchase a lot, and then contract a local builder to fill in the blanks. Building prices on the Outer Banks are competitive, and new owners will find no shortage of reputable and locally recommended builders available to construct their dream home. Like many national communities, the Outer Banks has its fair share of foreclosures, and prospective buyers should be on the lookout for phenomenal "short sale" deals. A short sale is basically a last ditch attempt by the bank or an owner to unload the property off their hands by offering it at an exceptionally reasonable price for a limited amount of time, and as a result, buyers can secure a property at much less than the property's actual value. The only drawback with a short sale is that many properties come with an "as is" provision, meaning that while home inspections are certainly allowed, the seller won't be conducive to making any repairs. For handymen and handywomen, however, a short sale or foreclosure is an ideal opportunity to rapidly increase the value of a property with a little bit of elbow grease. As such, the short sales and foreclosures on the Outer Banks are definitely worth a look for buyers who love a good home improvement project. Want to maximize your rental income? Then start your vacation rental home search in the winter or early spring. As a general rule of thumb, annual rental income is transferred from the seller to the buyer on the closing date, which means that if a closing occurs in March or April, the buyer can enjoy a full season of rental income without any lag from the previous winter. The spring, in fact, is generally known among REALTORS as the most active season of second and investment home sales, simply because of the full year of income. Have fun hunting, but bear in mind that as the Outer Banks' most productive real estate season, being an early bird might be a huge benefit in securing an attractive property. Have specific criteria and a little time before you nail down a decision? Sign up for automated email updates. Many local REALTORS can take your specifications and assign you to a mailing list sponsored by the MLS which will send you up-to-the-minute notifications on new properties for sale or price reductions. By receiving instantaneous updates on properties related to your criteria, you can ensure to be the first to know when a new property hits the market, or one of your favorites has dropped its listing price. For prospective rental or investment property owners, many property management companies also have in-house real estate sales teams that work with property managers on a daily basis, and can help prospective buyers in finding homes that are very guest-friendly. By choosing a REALTOR associated with a property management company, a buyer can essentially maximize their potential rental income by learning, first hand, what properties can generate the most visitor interest, and what improvements can be made to specific properties to make them more renter-friendly. In fact, many buyers find that in addition to their buyer's agent, they also have access to a local property manager that can guide them in additions or changes that will be the most attractive to potential renters. Basically, if you want a great rental home, then go to the source. The combination of expert real estate agents and expert property managers will help your prospective vacation rental home reach its full earning potential. Many folks dream about owning a home on the beach, but few realize that a second or primary home on the Outer Banks is actually a very obtainable reality. 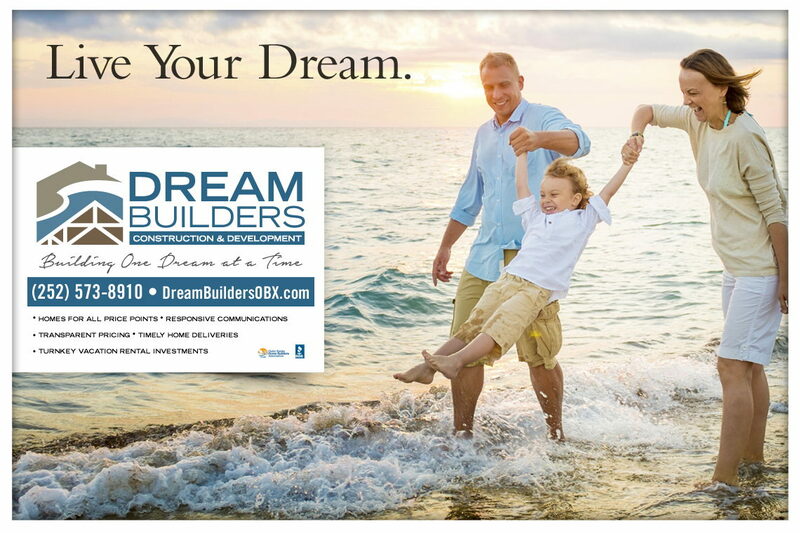 Whether you're looking to invest in a vacation rental property your family can enjoy for generations, interested in buying a lot to lay down the groundwork for your dream home, or simply want to enjoy the beach life full-time with a permanent relocation, you'll find the Outer Banks real estate market perfectly accommodating to your expectations. Best of all, the sheer variety of properties for sale virtually ensure that every taste and budget is accounted for, so prospective buyers will have no problem finding a portfolio of homes or lots that meet their specific criteria. Intrigued? There's no harm in learning a little more, and experienced local buyer's agents are always on hand to answer questions, whether you've visited the Outer Banks for a day or a decade. On your next vacation, don't be afraid to contact a local Outer Banks REALTOR and take your first step into being a happy, full-time supporter of the beach life on the Outer Banks. Offering full lunch and dinner menus with American and seafood fare and cocktails. Voted best deck dining on the beach. Relaxed and family friendly atmosphere. The spectacular view from Rundown Café’s newly renovated upstairs Hula bar deck is unrivaled on the beach. The restaurant offers seating on the deck, as well as more intimate seating inside either the upstairs bar or more family oriented downstairs dining room.